In mid-February, I had the opportunity to visit the iStreamPlanet facility in Las Vegas to experience the end-to-end streaming solution behind the 2014 Sochi Winter Olympics. It was an opportunity to see and discuss the major workflow components with the solution providers, which included iStreamPlanet's Aventus, Microsoft Azure, Adobe Primetime, and Akamai. This certainly isn't the first time that the Olympics have been delivered online. This isn't even the first time it was delivered by the players noted above. What makes this Olympics so unique is that it was the first time it was delivered end-to-end via the cloud. According to data released on Microsoft TechNet, over the event's 18 days, "Windows Azure provided information on the Games to more than 100 million fans and guests through sochi2014.com and delivered more than 6,000 hours of high-definition streaming from Windows Azure Media Services, to 5 broadcasters across 22 countries in 4 continents. This included 204 live streaming channels, more than 100 TB of storage and around 500 billion storage transactions." The ingest and management of live streams delivered on behalf of NBC in the United States was handled by iStreamPlanet, whom I've worked with for many years delivering high profile Microsoft events including keynotes, conferences and product launches. Along the way, we've had many "firsts" relative to breaking new ground on how content was delivered, how much bandwidth was pushed, how many viewers tuned in, which technologies were in play, and so on. That said, the encoding was always done by high-end hardware systems sitting locally in racks, turning HD-SDI signals into bits, and then sending them out to a Content Delivery Network. 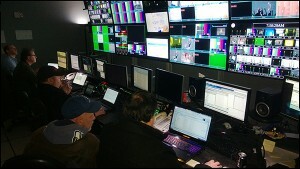 This is a common workflow today, and Master Control Centers are still predominantly signal based for many broadcasters. Additionally, those that have converted their live encoding workflows to IP are still primarily doing the heavy lifting on-prem. This is about to change. It wasn't all that long ago when cloud advocates were still hesitant to include real time video encoding of contribution quality cotent as a feature the cloud could bring to the table. Those that did, often considered GPU accelerated instances or highly customized cloud implementations as a pre-requisite for achieving sufficient performance. Contrary to this perspective, the Sochi Winter Olympics demonstrated that professional broadcast standards of quality and performance can be delivered via the cloud at massive scale…. and the benefits are enormous. One notable benefit of moving these workflows to the cloud comes in the form of cost savings relative to your infrastructure investment. The expense of broadcast equipment (satellite dishes, receivers and decoders, signal based frame syncs and routers, power and cooling systems, monitoring systems, and so on) begins to disappear when following the model used for the 2014 Winter Olympics. Additionally, the bottlenecks that those systems impose also start to disappear when shifting to the cloud. In Azure, new encoding and origin instances can be added and removed as demand dictates, which means your capacity is no longer limited by your annual capital budget. Likewise, since you're only paying for what you need, when you need it, you can truly adapt your capacity to seasonality. Even on-demand storage costs can be reduced dramatically by leveraging Dynamic Packaging in Azure Media Services. I should note, I completely understand the reluctance many broadcasters will have to embracing workflows that can't be seen and touched within the facility. I often feel this way myself. However, that's where solutions like iStreamPlanet's Aventus enter the equation. Aventus is a real time ingest, stream management and publishing system that has been designed and deployed by a company that has lived and breathed live webcasting for over a decade. They've seen and solved for most of the problems broadcasters will face, and they've built the solutions into a platform that sits in the cloud to exploit the benefits noted above. Handling the many nuances associated with webcast delivery like captions, lost source signals, encryption, ad cues, pre-show/post show slates, redundancy, fault tolerance (and the list goes on), are key tenets of the platform. Furthermore, during the Olympics broadcasts, iStreamPlanet was able to reliably monitor the health of the end-to-end workflow on dashboards (complete with feed status and thumbnails) that spanned just a few PC monitors. Another key benefit of the solution is that default media encoding profiles developed by industry experts like Alex Zambelli are built directly into the platform (CEO, Mio Babic, lightheartedly refers to this as Zambelli Inside). Certainly, there is no requirement to leverage a platform like Aventus in order to leverage the cloud, but it can go a long way toward applying the broadcaster's mindset to an off-prem solution. In summary, there will definitely be challenges that continue to present themselves moving forward. There will be technical challenges, like the continually increasing horsepower and bandwidth needed to encode and deliver emerging resolutions and formats such as h.265/HEVC and 4k. And, there will be budget management challenges as companies start to move from CAPEX to OPEX thinking and planning. Still, it's clear that the Sochi Winter Olympics provided a sneak peek down a path that broadcasters will ultimately be taking toward the cloud. 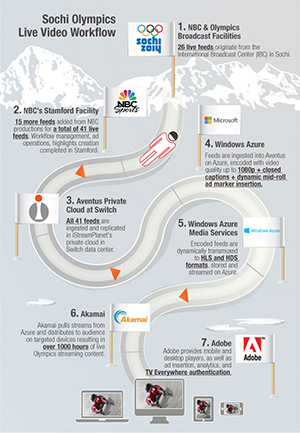 Additional Information: Learn more about Microsoft's involvement in the 2014 Winter Olymics. Learn more about the webcasting technical solution via Alex Zembelli's blog. Learn more about how the Olympics streaming performed via iStreamplanet's blog roll.